Wilhelm’s was a new and used car dealership that held franchise rights to the Buick, Oldsmobile, Cadillac, and Mazda nameplates. The business was founded by Don Wilhelm when its first dealership opened in Jamestown in 1960. 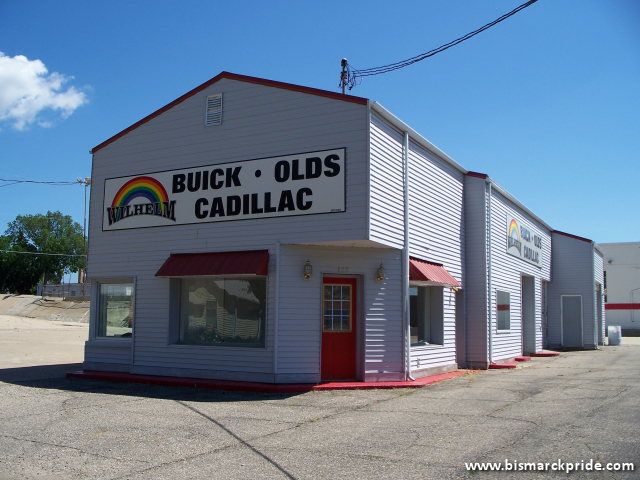 The Bismarck location opened in 1986 upon purchasing the current Buick-Olds-Cadillac dealership at the corner of 1st Street and Broadway Avenue. In November 2006, it was announced that Wilhelm’s franchise rights to the Buick and Cadillac nameplates were being transferred to Schwan GM Auto Center, as part of GM’s efforts to consolidate its operations. This came just two years following the phase-out of Oldsmobile, of which Wilhelm also dealt. Wilhelm continued as a Mazda dealership for a short time after losing its position as a GM dealership, before forever closing. The building that housed most of Wilhelm’s operations was torn down in July 2009. The site that housed the Wilhelm dealership had originally housed Fleck Motors, which was located at the site for more than 40 years. The Fleck Motor building is still standing, built in 1952 to replace its original building destroyed by fire.